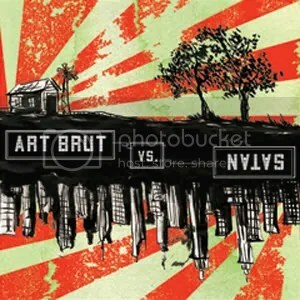 Art Brut Vs. Satan is the British quintet’s third full-length; this one is produced by Frank Black aka Black Francis aka Charles Michael Kittridge Thompson IV aka the lead singer for the Pixies. We get eleven songs of fun, upbeat British rock/post-punk goodness filled with witty lyrics (many referencing other bands, songs, and music in general, along with several other pop culture references) that are delivered in singer Eddie Argos’ trademark deadpan talking style. I’ve liked this band since I heard them in 2005 on their debut, and this album is no exception to their awesomeness. This entry was posted on April 23, 2009 at 12:00 pm and filed under TheSlacker. You can follow any responses to this entry through the RSS feed.